At a very young age, Jared Pike was introduced to the game of hockey and like most, the love affair started then and continues to this day. 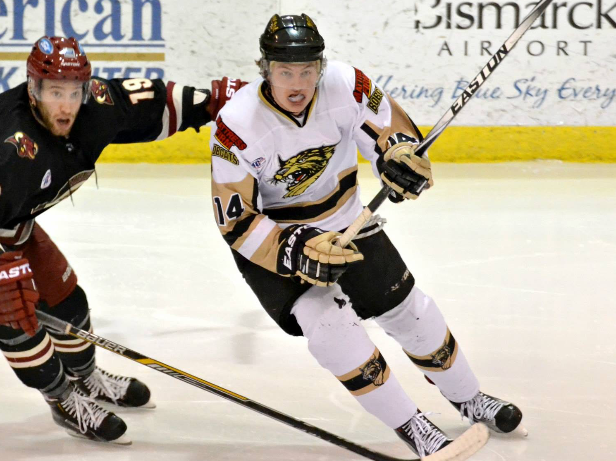 Now 20 and playing in his second season for the Bismarck Bobcats of the North American Hockey League (NAHL), Pike was recently named to the NAHL’s Top Prospects Tournament (TPT), which will be held Feb. 15-16 in the Detroit suburb of Plymouth, Mich.
Pike said his main goal in Plymouth is to get noticed by NCAA Division I college scouts. “The scouts want to see winning hockey teams play, so I need to contribute by playing a full, 200-foot team game,” Pike said. Starting out playing local hockey for Salt Lake County when he was four, there was already a background in the sport as Pike’s father, James, played high school hockey for Cottonwood High, just outside Salt Lake City, and his uncle, Kerry Karinen, played NCAA Division III at St. Scholastica. Pike also skated for the Utah Stars, Utah Jr. Grizzlies, Davis County Youth Hockey Association, Davis County Golden Eagles and the Team Northwest Regulators. Three years ago, he left home to play for the Los Angeles Jr. Kings 18U AAA squad. Now with a chance to advance up the hockey ladder, Pike is hoping to make that happen in short order.